“You kinda remind me of Frank Cannon,” said the guy at work. “Frank who?” I responded, and then googled the name. Frank Cannon was a Private Eye from a popular TV series, played by William Conrad. I don’t think I look like Frank Cannon, but I think he was saying my girth reminded him of William Conrad’s. 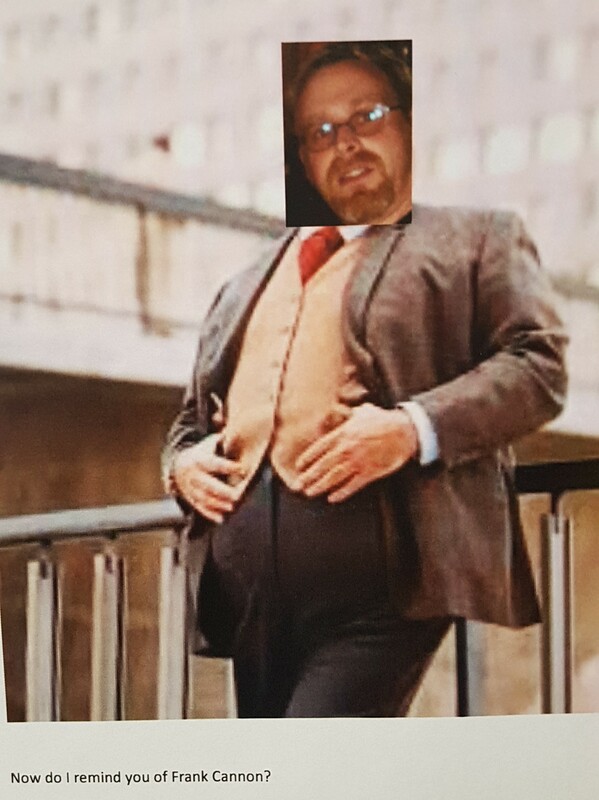 Another guy at work did a photographic amalgamation. Frank “LeBrain” Cannon can be seen below! You look like Odin. That’s cool. Sometimes people forget that some of the thoughts in their head don’t need to come out into the world. Wonderful attention to detail in the photo edit! Back in the early 90’s a girl dated me because she had an obsession with Gowan and apparently I looked like him then. She was a strange animal. That’s what I know. She didn’t know about Dr. Feelgood’s Criminal Mind, though. Hahaha yes! And she carried a torch for you. A Burning Torch Of Hope. The question is, did you decide to Keep The Tension On? Even though she wore too much Cosmetics, her Moonlighten Desires could still Awaken The Giant. William Conrad in Jake and the Fat Man was my jam. I think I liked the name of the show better than the show itself. I thought I recognised him! Don’t you just love people you work with? I used to listen to these old radio programs at night. William Conrad (You) was the voice of Paladin in ‘Have Gun Will Travel’. I don’t get the resemblance but it is a “chuckle”. Definitely gave me a laugh. I’ve been called worse! “Frank Cannon” is such a cool name. CB is jealous. I’d go to the show for that one cut and probably jump on stage like a nut.